Pedigrees can be pretty intimidating, so I'm going to break it down for you. For this exercise, I've pulled a four generation pedigree on my doe, Honey, on ADGA Subscription Reports and I marked it up to show the relationships of ancestors to her. This is a goat's family tree. In the first generation, to the left, it shows Honey's Dam and Sire and any relevant production data collected on them. 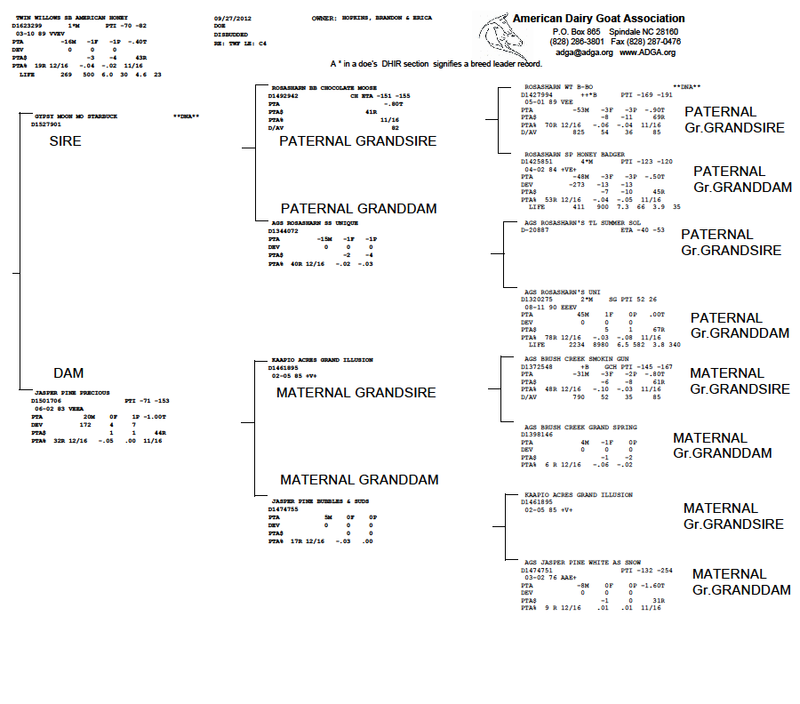 The next row, in the middle, shows Honey's Dam and Sire's Parents and any relevant production data collected on them. In the last row, four generations back, it shows Honey's Great Grandparents and any relevant production data collected on them. So what does all of this mean? Scroll down past the picture for an explanation. Let's focus on Honey's data first, which you will find in the upper left corner of the pedigree. First, you will see her registered name, Twin Willows SB American Honey. Twin Willows is the herd name. "SB" stands for Starbuck, which is her sire's name. Many farms attach a sire designator between the herdname and her actual name, which in this case is American Honey. To the left of her name, you will find her date of birth, the fact that she is a doe, that she is disbudded, and then under that you will find her tattoos, which are unique from every other goat registered in ADGA. In case you missed the explanation of tattoos, she has TWF tattooed in her right ear, and C4 tattooed in her right ear. The right ear (TWF) shows the unique herd tattoo sequence, and the left ear (C4) shows that she was born in 2012 (C) and she was the 4th baby born that year at Twin Willows. Under her name you will see D1623299. The "D" stands for Nigerian Dwarf. All Nigis registered with ADGA start with a D, and then the string of numbers is assigned by ADGA based on when she was registered. This is Honey's official ADGA registration number. To the right of her registration number, you will see 1*M. This means that she is a first generation breed leader for milk. If her dam was starred, then this number would say 2*M, and her dam would be 1*M, and so on. Any daughters born to Honey who earn their Milk Stars will be 2*M. Stars are earned by having high milk volume, butterfat and/or protein content in her milk. Next, we are going to jump down to the last line and you will find her milking stats. Next to LIFE, which stands for Lifetime Total you will find some numbers. The first number 269 designates the period of time she was milk tested, 269 days. The next number, 500, means that she milked 500 pounds of milk in that 269 days. The next two numbers, 6.0 & 30, means that she averaged 6% butterfat in that 269 days, and in that period of time, she milked 30 pounds of butterfat. The final two numbers, 4.6 and 23, means that in 269 days she averaged 4.6% protein and in total she milked 23 pounds of protein. Now, as a side note: The amounts of milk, butterfat and protein that you have to milk in order to earn a milkstar is based on the age of the doe at the time she freshened. She starred when she was a first freshener, and she was fourteen months old when she freshened. In order for her to star, she needed to milk at least 600# of milk, 21# of butterfat, and 18# of protein. In her case, she officially starred in butterfat and protein as a first freshener in ADGA. AGS has different requirements. To see the requirements, go to ADGA DHIR Advanced Registry Requirements and AGS DHI Requirements. Of those letters and numbers that are left around Honey's name that we have not yet discussed, these are the most difficult to understand. Let's break it down. PTA stands for Predicted Transmitting Ability. These numbers are calculated based on the animal's data and the data of her ancestors and progeny for both production and type. The first three numbers predict the pounds of milk, butterfat and protein from each lactation of the animals future daughters when compared to a herdmate of average genetic merit. The last number is the PTA of change to the Type score. These numbers rank animals based on genetic merit. This is the Standard Deviation we can expect in pounds. These numbers stand for Predicted Transmitting Ability Dollars. It is an economic index that estimates the extra dollars that a breeder would receive in each lactation based on the data provided. The first number stands for fat, the second for protein and the third number, is percentage confidence that these numbers are accurate. Reliability score for Production, first score is Fat, second score is Protein. First date is last date production was calculated and the last date is when type was calculated. PTI stands for Production Type Indexes--this is a genetic index that takes into account all of the above data and combines production and genetic evaluations into one score. The first number emphasizes production. The second number emphasizes type. Zero=no change. Animal won 3 official championships under at least 2 judges. A goat than has achieved Champion status and also has earned a milk star. Doe earned her milk star through DHIR programs. Doe earned her milk star on one day test or owner sampler program or on the basis of pedigree or progeny. ​A doe that meets the minimum requirements for milk production OR has 3 star daughters, or two star sons, or 2 star daughters and one star son. ​A buck that has a starred dam and has a starred sire with a starred dam. ​A buck that has at least 3 starred daughters from different does, or has 2 starred sons, or has 2 starred daughters and 1 starred son. A buck that has at least 3 starred daughters from different does and at least 2 starred sons. A buck that has at least 3 starred daughters, 2 starred sons, and a starred dam or sire. A doe or a buck that is in the top 15% of the production index for that breed. ​If ELITE follows PTA$, the animal is in the top 15% of its breed for Milk Fat Protein Dollars. ​DNA is on file for this animal at the registry. AGS pedigree was used to register this animal with ADGA.